Camilla Gibb was born in London, England, and has a Ph.D. in social anthropology from Oxford University. Sweetness in the Belly was an international bestseller that garnered critical acclaim around the world. Her novels, including Mouthing the Words and The Petty Details of So-and-So&'s Life, have been translated into fourteen languages. Camilla Gibb lives in Toronto. Camilla Gibb shares the recipes and stories behind the foods featured in The Beauty of Humanity Movement. 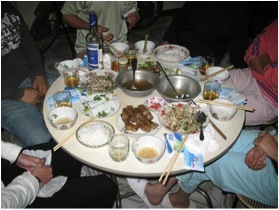 In Hanoi, I befriended a young man and his wife over a shared love of food. In Vietnam, urbanites eat, on average, three meals and three snacks a day, and they are passionate and ritualistic about what gets eaten when, with whom and how. Food is acknowledged as far more than a source of sustenance. It is an expression of culture, a repository of history, an embodiment of identity and a means of unifying family and community. Vietnamese food bursts with freshness, contrasting flavours and colour. There wasn't a thing I didn't devour and adore. Until the day I went to Phuong's house for dinner where I found myself confronted with a grey salad of par-boiled, diced pigs' ears. The cartilage crunched between my teeth in exactly the way you might imagine an ear might crunch between your teeth. I feigned pleasure, proclaimed it sublime, but my imagination could not serve me here. All the books below are recommended as readalikes for Camilla Gibb but some maybe more relevant to you than others depending on which books by the author you have read and enjoyed. So look for the suggested read-alikes by title linked on the right.